The Ukrainian army continues a large-scale offensive against the Donetsk and Luhansk People’s Republics. Indiscriminate shelling results in more civilian deaths. Grad, Uragan and Smerch multiple launch rocket systems were used in Nikolaevka to practically wipe this populated area out from the earth. There is no connection with the town so it’s impossible to know exactly what the death toll is. Semionovka and Slavyansk living quarters are regularly subject to regular bombing. Life support systems in Slavyansk are out of order; the city is encircled and blocked. Cars trying to get out are shot at. The details of the bloodshed are to be studied before they become known to public. In late January 2013 when former President Yanukovych still was in power, the Ukrainian government and Royal Dutch Shell inked the country's first major shale gas 50 year profit sharing agreement. 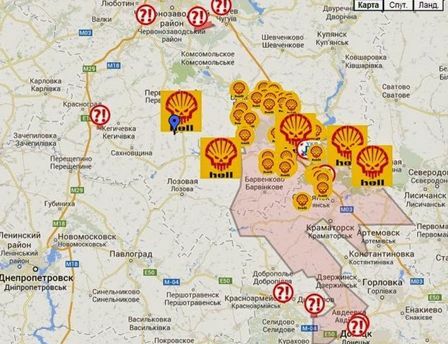 Shell plans to develop the Yuzov field in the Donetsk and Kharkiv regions. In June 2014 the company confirmed its intention to go on with the agreement as soon as the conflict gets de-escalated and the situation stabilizes. The information about the deal is classified. The Ukrainian government allegedly cannot refuse the extension of its term. The territory to be explored is 7886 square kilometers, including Slavyansk (situated right in the heart of deposit), Izium, a major part of Kramatorsk and a large number of smaller populated areas like, for instance, Krasny Liman, Seversk, Yasnogorsk, Kamyshevka etc. In accordance with article 37.2 of the agreement, the local residents have to sell their land and property. In case of refusal they are to be coerced to do it to serve the Shell’s interests. The company’s expenditure is to be compensated by Ukraine at the expense of produced gas. The government takes on responsibility for finding a solution to all the problems with local authorities. - Burisma Holdings, with Hunter Biden, the son of US Vice President being a member of board of directors. That is the main goal of those who launched the “anti-terrorist operation” or the Donbass slaughter. They want to establish total control over the Donetsk and Luhansk regions to clear the way for shale gas extraction (80-140 thousand wells). Arable lands would not be used for agricultural purposes, houses and churches will have to be destroyed to erect gas production infrastructure. Ukraine boasts 27% deposits of black earth. It’ll have to sell it abroad. It’s hard to do it in peacetime, but war time changes a lot of things. It’s important to reduce the population leaving only those who are needed to extract gas. The new Mayor of Krasny Liman appointed by Turchinov after the Ukrainian troops took the town has already promised local dwellers to create new working places instead of the ones they have lost as a result of industrial facilities damaged in war. Many believe that if the resistance is quelled, the control over the Donetsk and Lihansk regions will allow isolating Russia from a major part of European gas market. Experts believe the situation will get clearer in the autumn of 2014. The issue blew up earlier this month after comments from an unlikely source, NATO Secretary General Anders Fogh Rasmussen. The normally low-key official, who rarely comments on energy matters, told the London-based think tank Chatham House on June 19 that Russia was, as he put it, secretly backing some Europeans anti-fracking environmentalists in order to stop Europe from joining the U.S.’s shale-gas revolution—and hence keep the continent dependent on Russian gas exports. Rasmussen claimed NATO allies had detected Russian manipulation at work in the “sophisticated information and disinformation operations” within Europe’s well-organized anti-fracking groups. The Russian Aggression Prevention Bill of 2014 went to the US Senate on May 1 in an election-year broadside against administration policy, eight Republicans led by GOP Leader Mitch McConnell unveiled a package of penalties on Russia, assistance for NATO and exportation of U.S. natural gas. The senators said they hoped to secure Democratic support and, at a minimum, force the White House to develop a cohesive strategy rather than its ad hoc response. It means that the goal of establishing control over the Donetsk-Dneprovsk region deposits turned the war against the local people into an operation of extermination. Mass slaughter, spreading fear around turning local dwellers into refugees have become the main tools of implementing the policy of Kiev authorities who came to power after the coup. They serve the interests of transnational companies by being involved in ethnic cleansing of Russian population of Donbass. Human lives, the norms of international law and rules of waging contemporary wars don’t mean anything for those who are responsible for bloodshed. Some experts (E. Gilbo, for instance) say the estimations on how many people should remain in the regions have already been done. On July 4 the head of Donetsk self- defense formations of Donetsk People’s Republic Igor Strelkov said that if Russia will not achieve an agreement on ceasefire and will not launch a peace making operation, the Slavyansk with its 30-thousnad population will be wiped from earth in a week or two. P.S. For many weeks the self-defense formations have distracted large forces of Ukrainian army keeping them concentrated around the besieged Slavyansk. Later on June 5 the militia units broke through the encirclement to gain freedom of action outside the limited battle area.